Chindits: Cooper Corporation signs MoU with Garden Reach Shipbuilders and Engineers Ltd. (GRSE) for Development of Diesel Engines for Indian Navy & Indian Coast Guard. 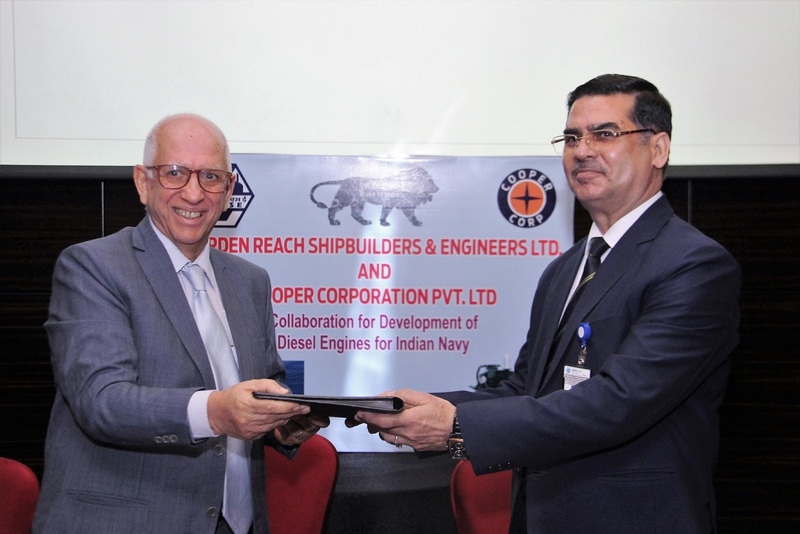 Cooper Corporation signs MoU with Garden Reach Shipbuilders and Engineers Ltd. (GRSE) for Development of Diesel Engines for Indian Navy & Indian Coast Guard. The association will jointly develop and manufacture efficient, path breaking power supply solutions for the Indian Navy and Indian Coast Guard. Pune, October 16, 2017: Cooper Corporation one of India’s leading engine manufacturers, entered into a strategic Memorandum of Understanding (MoU) with Garden Reach Shipbuilders & Engineers Ltd. (GRSE), A Government of India Undertaking – Under Ministry of Defence for joint development and manufacturing of small and medium diesel engines for marine applications. The MoU was signed by Sri Sarvjit Singh Dogra, Director Finance on behalf of GRSE and Mr. Farrokh N. Cooper, Chairman and Managing Director, Cooper Corporation in the city today. Other dignitaries present on the occasion were Mr. Dilip Kumar Jagattar Singh DGM (I/C-DEP),CDR. Gaurav Pande, Regional Officer-Mumbai and Mr. VD Sivakumar, Corporate Head - Marketing&Sales, Cooper Corporation. Over the years, Cooper Corporation has consistently invested in the latest state-of- the-art technology across 75 acres of land at 11 plants in Satara with the help of experienced consultants from all over the world. The company has set-up its own R&D unit to explore the possibilities of developing new products. Cooper Corporation’s commitment to quality, service and product innovation has consistently kept pace with the changing market needs worldwide. The company’s rapid strides in the global market bear testimony to this fact. Cooper Corporation’s products have been accepted internationally in countries ranging from Central America, Africa, South Africa, Saudi Arabia, Bangladesh, Sri Lanka, Russia, Ukraine, UAE, Vietnam and Afghanistan. Today Cooper supplies auto parts and engine components to all leading OEMs in India and across the world from Japan to Europe and the USA.